A Japanese green tea-obsessed cafe with roots across the Pacific just landed in Venice—and they&apos;re making a splash with their sparkling matcha sodas and sliders drizzled with tart ume-mayo. At first glance, the minimalist Shuhari Matcha Cafe looks very modern, with its sleek, white-tiled walls and muted, wooden accents. But once you dive into the tiny cafe on Abbot Kinney, you&apos;ll come to realize that the team behind it is trying to meld the old school with the new. Their drink menu is a doozy, with over 40 green tea beverages, some of which have modern twists like matcha lattes laced with nutty kinako powder and kuromitsu—a molasses-like syrup. And then there are all the bubbly matcha sparklers (which could very well become the it drink of the summer) that are refreshing and heightened with flavors like freshly squeezed lemon juice, yuzu, pineapple and mint. Just like getting a drink at a bar, these sparklers are mixed together in cocktail shakers behind the counter. Trust us, get one. If you&apos;re a purist, you can order green tea brewed the right way—and get to watch the meticulous process in action behind the counter that&apos;s decorated with rows of Japanese tea pots. 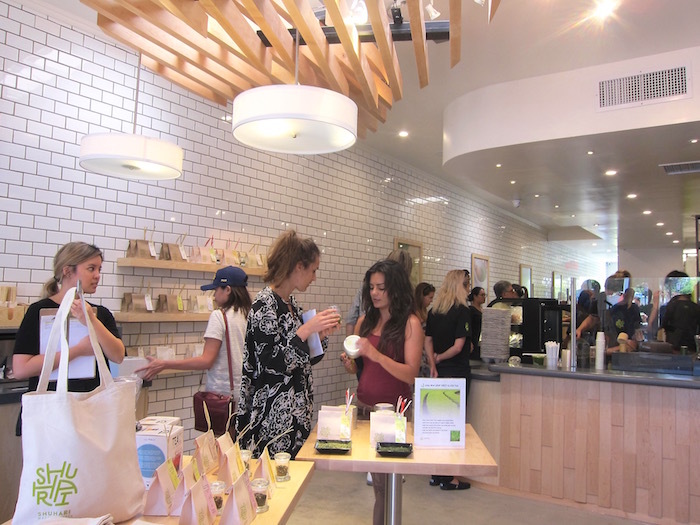 Marc Chapman, Shuhari&apos;s manager, told LAist, "Each different tea is made properly, from the temperature to the steeping time to the water and what not." If you couldn&apos;t tell already, these guys are serious about their green teas. Their jade-tinged tea leaves are sourced straight from the tea fields in Japan and curated by an expert who works with the tea farmers. 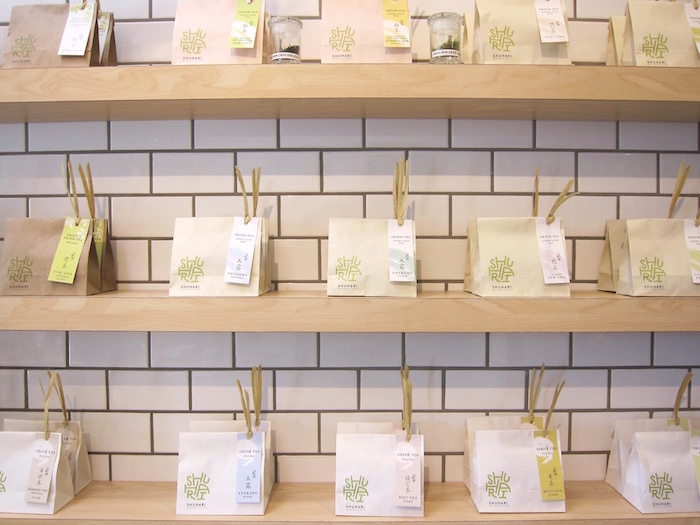 If you want to expand your knowledge of green teas, they have a wall lined with bags of different varieties that you can buy and take home. We were invited to check out Shuhari&apos;s grand opening on Thursday, and found glass cases full of Japanese grab-and-go pastries—like red-bean buns and curry bread—that hail from Cream Pan, a Japanese bakery in Tustin. The rest of the food comes from the mind of chef Michael Bower Johnston, who lived in Japan for 20 years and previously ran Wolfgang Puck&apos;s restaurants in the Land of the Rising Sun. He&apos;s a big supporter of making texture the star in his small bites, and it&apos;s evident in the dishes. Take, for instance, his sundaes. 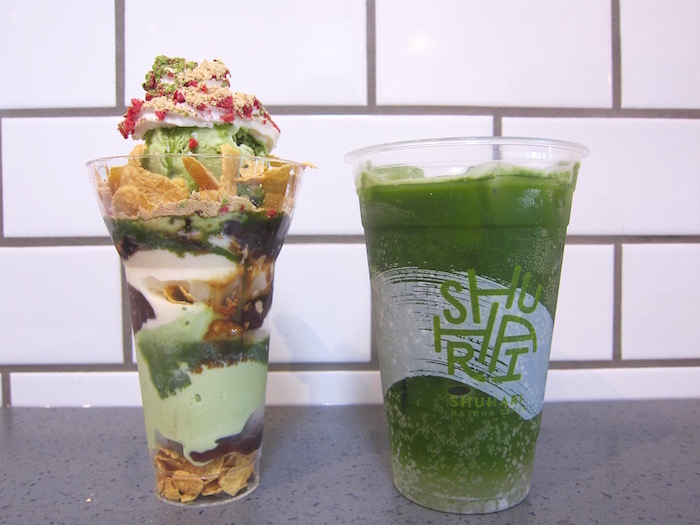 The signature matcha sundae is a tornado of matcha ice cream swirled with red bean and kuromitsu syrup, and then gorgeously topped with crunchy cornflakes, lightly sour dehydrated raspberries and dusted with matcha and kinako powders. It&apos;s a balanced dessert that isn&apos;t overly sweet and chock full of texture, just like Johnston intended. Their grab-and-go onigiratzu is an popular trend imported straight from Japan. 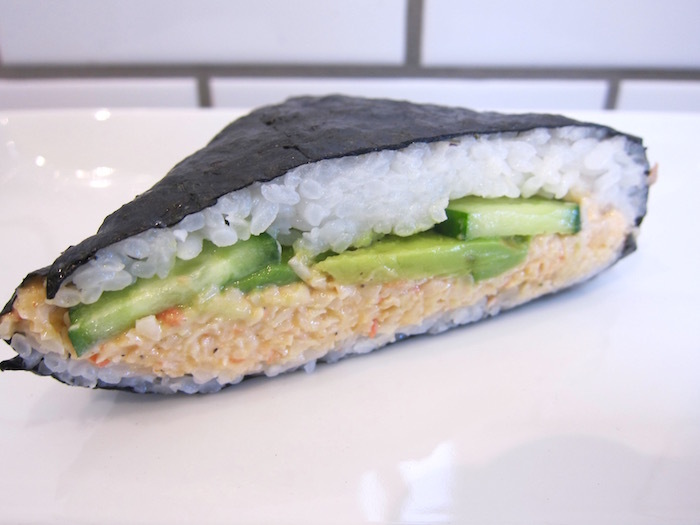 This one is similar to the onigiri rice balls, but instead of molding the rice balls by hand (which relates to the meaning of the word onigiri), the onigiratzu is sandwiched between layers of seaweed and rice. The fillings for the onigartzu are a "modern twist on the concept" and a "marriage of East-meets-West," Chapman said. 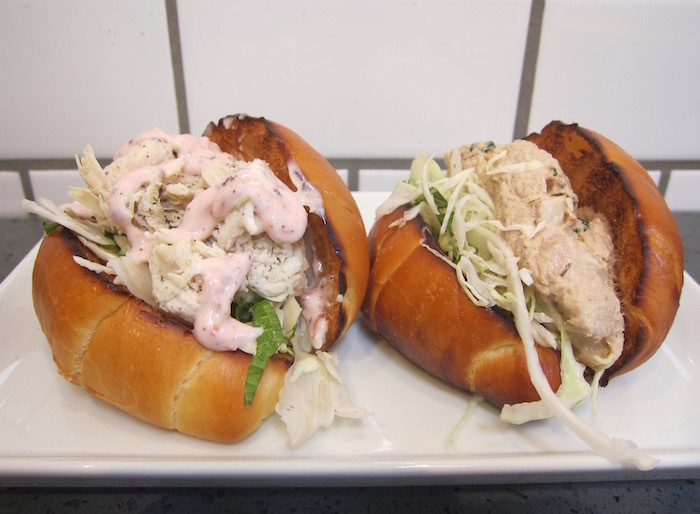 Inside you&apos;ll find shredded chicken topped with a flavorful umeboshi-mayo, or a yuzu-pepper sauce. Other fillings consist of pork loin stewed in a ginger sauce, and a creamy, wasabi-tinged tuna salad paired with hearts of palm. These fillings also make up some of Shuhari&apos;s sliders, which come out stuffed in the pillow-like, toasted bread rolls, and are paired with a crunchy slaw mixture of cabbage, shiso leaves and pickled shallots. You&apos;ll find other gourmet options like miso walnut pumpkin salad, and yuzu miso avocado on the menu. And if you&apos;re looking for something sweet, they&apos;ll even fill those rolls with house-made matcha butter or a strawberry balsamic glaze. 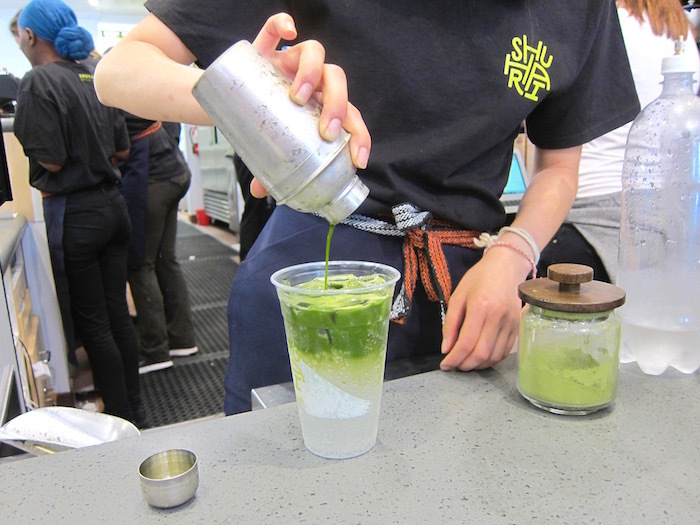 This is just the start for Shuhari Matcha Cafe. The company is planning on expanding their shops "hopefully to the rest of America and the world," Chapman said. Maybe they could be the next Starbucks? 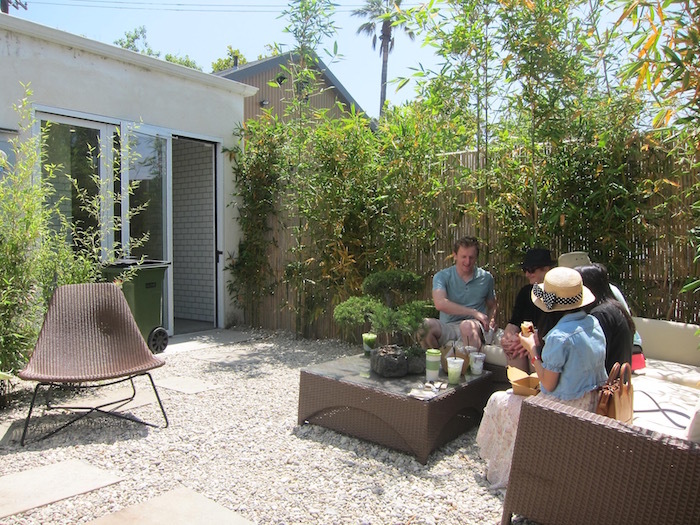 Shuhari Matcha Cafe is located at 1522 Abbot Kinney Blvd., Venice, (424) 238-8324. Starting on July 9, the cafe will be open daily from 11 a.m. - 4 p.m., and beginning on July 18, the hours will expand to 7 a.m. - 8 p.m. Drinks and food range from $3.50 - $8.50.